Ice Rink Liner | GeoCHEM Inc. 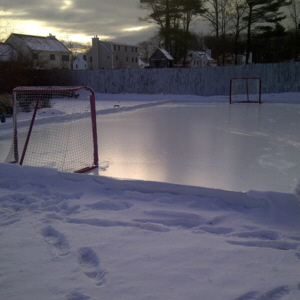 It is so easy... Geo Ice Rink Liners for your backyard and/or commercial ice rink. An Ice Rink that you can actually afford to own. Our Geo Ice Rink Liners help you achieve indoor quality ice, without the hundreds of dollars charged per hour by indoor ice rental rinks. 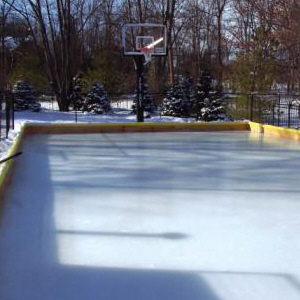 In as fast as a single day, you can set up an affordable Ice Rink with our Geo Ice Rink Liners for your hockey and/or skating ice rink on any reasonably level surface. 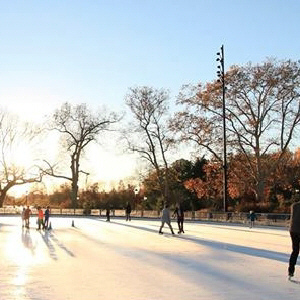 For hockey practice, figure skating or plain old outdoor fun, Geo Ice Rink Liners make ice rinks practical and affordable. Geo Ice Rink Liners are available in standard lengths and widths as well as custom fabricated widths and lengths. Standard ice rink liner sizes in stock ready for shipment. Custom fabricated Geo Ice Rink Liners available in 4 to 10 days plus transit time inbound destination of choice. Please remember that your backyard or commercial ice rink will be smaller than your Geo Ice Rink Liner required your ice rink. 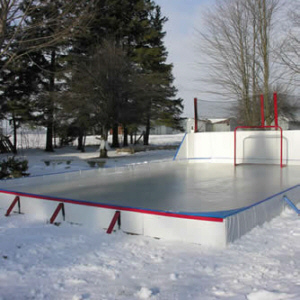 Add an additional 5 feet to your Geo Ice Rink Liner in both width and length to obtain the ice rink size you desire. TYPE II LFL WHITE / BLACK LINER COST: $0.060 /SF [ 25, 33', 40' wide ] + Freight. TYPE II LFL WHITE / BLACK LINER COST: $0.070 /SF [ 50', 60', 70', 80', 90', ETC... wide ] + Freight. TYPE 1 HC LINER COST : $0.15/SF + Freight. 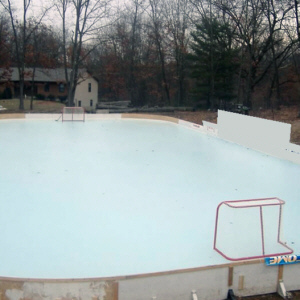 Type 1-HC Cross Laminate Geo Ice Rink Liners are produced by cross laminating two sheets of White high density polyethylene, creating additional strength for optimum puncture and tear resistance for your backyard ice & hockey rink. This unique process aligns the molecular structure of the high density polyethylene intensifying the sheet’s resilience creating an Ice Rink Liner having equal strength in all directions. 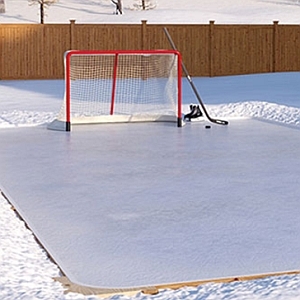 The Type 1-HC Cross Laminate Geo Ice Rink Liner is an excellent choice for your ice hockey and ice skating rink liner applications. Not only will the rugged qualities of the Type 1-HC Cross Laminate Geo Ice Rink Linerwithstand the most demanding ice skating conditions, it will not rot or mildew and is resistant to most chemicals, salt and acids making this a valuable multi-season ice rink liner. Type 1-HC Cross Laminate Geo Ice Rink Liners are an excellent choice for applications requiring greater performance than common 6 mil plastic sheeting This ice rink liner is guaranteed to remain flexible at 70 degrees below zero. Minimum Use Temperature: Minus (-) 70 Degrees F.
TYPE 1 HR LINER COST : $0.13 /SF + Freight. Type 1-HR Reinforced Geo Ice Rink Liners are economical, Super White Reinforced 6 Mil film designed for your backyard ice & hockey rink with excellent puncture resistance and high tear strengths. A heavy-duty scrim reinforcement, laminated between two layers of virgin high-strength polyethylene film, results in a material that resists punctures and immediately stops tears. The addition of ultra violet inhibitors to our Type 1-HR Reinforced Geo Ice Rink Liners, respectively, increases outdoor longevity. Type 1-HR Reinforced Geo Ice Rink Liners is an excellent choice for applications requiring greater performance than common 10 mil plastic sheeting. This ice rink liner is guaranteed to remain flexible at 70 degrees below zero. Minimum Use Temperature: Minus (-) 70 Degrees F.
TYPE 1 HR8 LINER COST : $0.15 /SF + Freight. Type 1-HR Reinforced Geo Ice Rink Liners are economical, Super White Reinforced 8 Mil film designed for your backyard ice & hockey rink with excellent puncture resistance and high tear strengths. A heavy-duty scrim reinforcement, laminated between two layers of virgin high-strength polyethylene film, results in a material that resists punctures and immediately stops tears. The addition of ultra violet inhibitors to our Type 1-HR Reinforced Geo Ice Rink Liners, respectively, increases outdoor longevity. Type 1-HR8 Reinforced Geo Ice Rink Liners is an excellent choice for applications requiring greater performance than common 10 mil plastic sheeting. This ice rink liner is guaranteed to remain flexible at 70 degrees below zero. Minimum Use Temperature: Minus (-) 70 Degrees F.
TYPE III C LINER COST : $0.23 /SF + Freight.